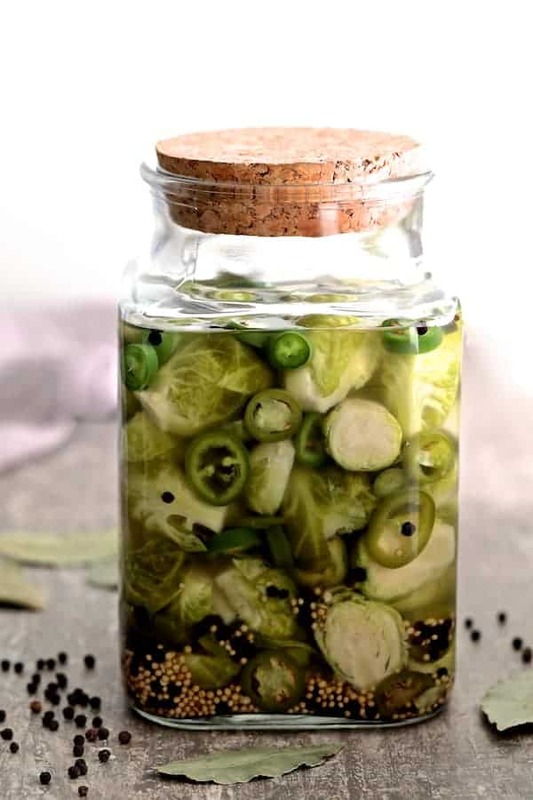 Quick Pickled Brussels Sprouts with Jalapeno are the perfect accompaniment to anything you’re serving this holiday season! They’ll make a great gift for the Brussels sprout-obsessed (raises hand) or are the perfect accompaniment to a spicy Bloody Mary, roasted meats, sandwich or meat and cheese tray. Meet the Brussels sprouts that didn’t make it to our Thanksgiving table. The plan I had was to roast them. However, because I only have one oven, I couldn’t get them done. The kids and grandkids are picky eaters so chances were I would be the only eating them anyway. I went through our refrigerator the other day to clean up and clean out the rest of the Thanksgiving leftovers and found the forgotten Brussels sprouts. I’ve been itching to make pickled Brussels sprouts because they’re not easily found in the South! First, I LOVE pickled anything. This is probably too much information, but I can pretty much eat a jar of dill pickles in one sitting–two sittings tops. I guess it’s my Polish heritage. 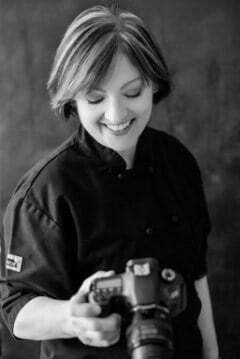 Everything, including fish was pickled a long time ago to preserve it because of the lack of refrigeration. 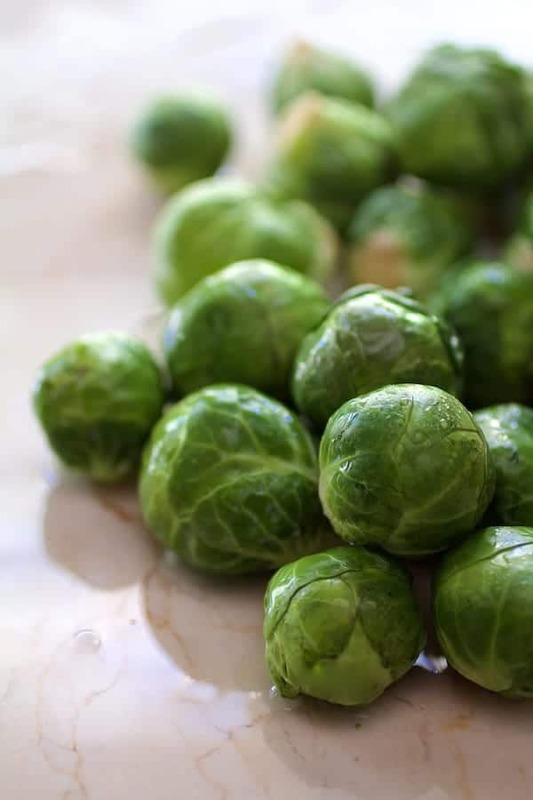 When Brussels sprouts sit, they tend to develop a more intense “cabbagey” flavor. While they would have probably been fine roasted, I didn’t have the heart to throw them away. Instead, I decided to pickle them. Good decision on my part! These are super quick and easy! 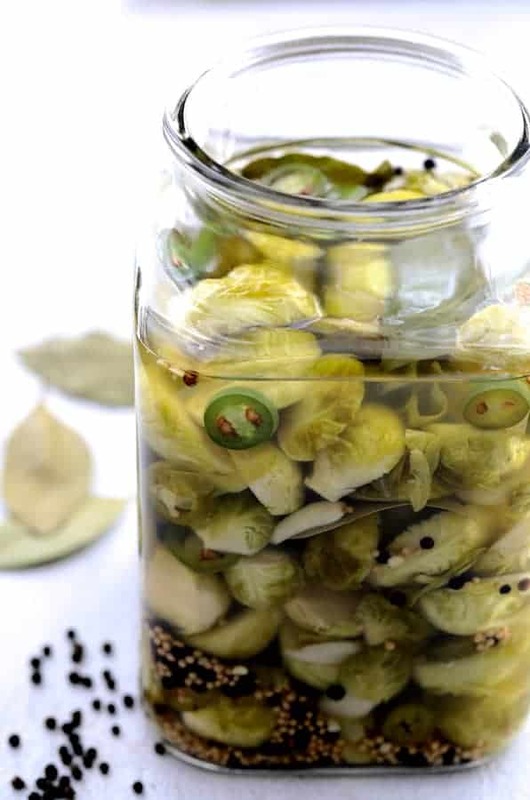 The pickled sprouts get stored in the refrigerator so no water bath or canning knowledge is necessary. Simply trim, cut in half, then cook for a few minutes is heavily salted water. Try them and if you like Brussels sprouts softer, cook them longer. 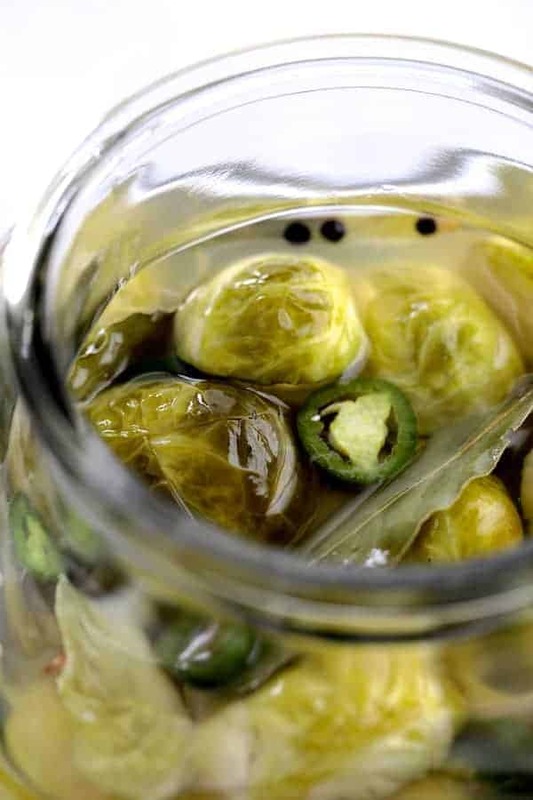 Place the Brussels sprouts, jalapeno and garlic in a clean (sterilized if possible) jar. Make the brine, and carefully pour it over the sprouts. Cool, then place in the refrigerator and let them sit for five days before enjoying. That’s it! For more information on how to quick pickle any vegetable, here’s a great post at The Kitchn. Here are two more crazy good Brussels sprouts recipes! Quick Pickled Brussels Sprouts with Jalapeno are the perfect accompaniment to anything you're serving this holiday season! They'll make a great gift for the Brussels sprout-obsessed or are the perfect accompaniment to a spicy Bloody Mary, roasted meats, sandwich or meat and cheese tray. Prepare an ice bath. Bring a pot of salted water to a boil. Add the Brussels sprouts and cook 2 to 3 minutes (longer if you want them softer). Transfer to the ice bath to cool. Combine water, vinegar, peppercorns, mustard seeds and 2-3 tablespoons salt in a saucepan. Bring to a boil and simmer until the salt dissolves. Taste the brine and if desired, add a small amount of sugar. Drain Brussels sprouts and place in a tall, clean jar. Add the jalapeno, garlic and bay leaves. Carefully pour the hot brine over the Brussels sprouts. (You may have some brine leftover. Cool to room temperature. Cover and place in the refrigerator 5 days before serving. Store refrigerated up to a month. Oh man, I LOVE this idea!!! I wonder if they could even get my brussels sprouts-hating husband on board… He LOVES jalapenos!! With a Bloody Mary? Why not!